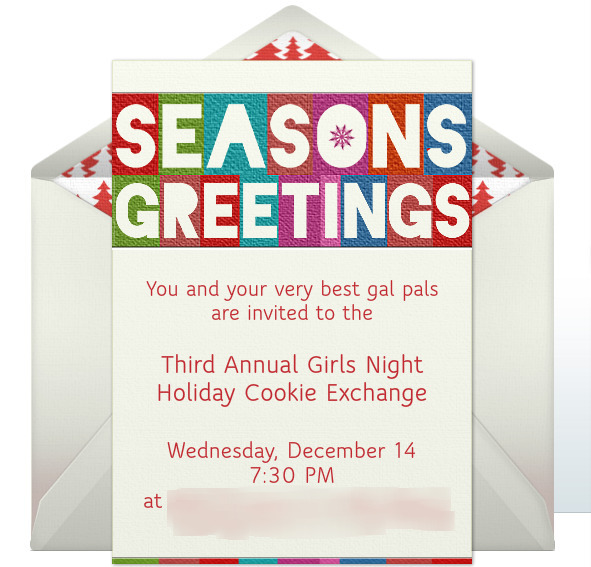 Tonight is my Third Annual Girls Night Holiday Cookie Exchange! 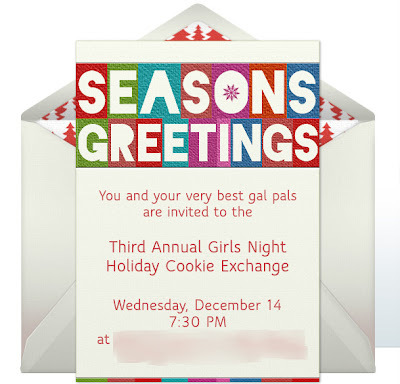 Get your own fab e-invites from Punchbowl, my personal fav source. I think you might remember the after-video and photos from a few years ago of the ladies in action? This year, I am hoping for nothing less than another night full of wine, laughter and precious time spent with some of the busiest and most-fabulous gals around town. I am so thankful that they have all chosen to block off a night on their crazy holiday calendars to spend together, too. To keep things simple for this party that has grown to house 20-30 guests, I always ask the girls bring their own wine and two dozen cookies to share and exchange. This keeps costs down for me as the hostess, but also ensures that we will have plenty to share just in case the unexpected (though totally expected, at this point, since we all know how our crowd works!) few extra gal pals tag along. I will be supplying my special mulled wine to start the party off, along with a selection of "savory snacks," aka insurance that the girls don't get sugar- and wine-high on totally empty stomachs, resulting in extra-unpleasant headaches the next day :) This year, I am making my mom's marinated cheese recipe with crackers, which sits overnight and then inverts onto a serving platter. Easiest day-of appetizer prep, hands down! I am adding to that my guac two-bites, which are festively-colored for the Christmas theme, and some cheesey sausage balls that I made and froze on Monday and will throw into the oven to finish tonight. Other than that, I let the party run itself! Christmas music cued up on Pandora through the TiVo, festive decor all around the condo, and an open door that guests are welcome to let themselves into. Friends and more friends are always welcome; there is always guaranteed to be at least one new face among the crowd. The wine is free-flowing, as is the laughter. I will be back this weekend with a photo recap of the evening, and if you are lucky, a recipe or two from some of my guests for their fabulous cookies. In the meantime, do share: what are your go-to favorite cocktails and/or appetizers to make when hosting a party?